Over four days in October of 2009, collaborative artists Harvey Loves Harvey created fourteen performance art interventions along 14th Street in Manhattan. Each of these vignettes was created based on a moment in the history of New York, and intended to draw attention to the ways in which everyday life intersects with our past. These actions were sometimes personal, or historic, or sentimental. Each action was performed on or near a site of importance to the artists and their understanding of history. 14th Street spans the heart of Manhattan, starting at the Hudson River and the waterfront, running through the lower part of Chelsea, across 5th Avenue, Union Square and Broadway before entering the East Village and Stuyvesant Town. To walk along 14th Street is to walk the history and future of New York. Choosing fourteen of the major intersections along 14th Street, Harvey Loves Harvey started to examine the broad history of the city. Incorporated in these actions are Civil War Generals, pre-Colonial explorers, World War II secrets, Beat Poets, the Labor Movement, a Kennedy, and a music critic. As diverse as the history of New York can be, so are the 14 Actions a scattered, seemingly random selection of historical moments, acted out by two guys in hard hats. For over a decade, Harvey Loves Harvey has explored the various roles of the contemporary artist by isolating and exaggerating aspects of those roles that they see as problematic or complex. For the artist who goes away to the studio and explores ideas, experiments with media, and tries to figure things out, Harvey Loves Harvey has created the artist as Scientist. Wearing white jumpsuits and safety goggles, they explore and test ideas that may not be wholly quantifiable. What is humor? Can you test morality? What is individuality? What is failure? For the artist who must present their work to the world, and convince others of the value of an artistic experience, they have created the artist as Salesman. Wearing business suits and ties, they attempt to convince others of the value of their work. Appearing in infomercials, low budget television ads and as confrontational salesmen, they look at how artists must take the delicate ideas behind their art and sell them to the world. Most relevant to the 14 Actions is the idea of the artist as Laborer. Once the ideas are formed and the pitch made, someone has to go through the labor of actually making the art. Paint must be applied to canvas, photos must be printed, video edited, stone chiseled, wood carved. The artist as Laborer is the identity in which all of the 14 Actions were performed: there are no ideas to be invented, no audience to convince. There is only the job to be done. How much radioactive material came through the docks and shipyards of New York during the Cold War? We will probably never know. History is unlikely to ever offer a full accounting of that secret transaction, and the shores of Manhattan will forever keep quiet on the subject. Using a Geiger counter, Harvey Loves Harvey spent a morning searching for evidence of radiation along the waterfront, examining waterways, soil samples and air quality in a two block circumference around the corner of 14th Street & 10th Avenue. They recorded the readings taken by the device, and posted their findings. The Hello Kitty Geiger Counter was created by artist Tim Gregor in 2008. For Harvey Loves Harvey, the music of ’90s post-punk band Unwound has always been influential. As a favorite of both artists, Unwound has previously appeared in other work, notably Harvey Loves Harvey Presents Unwound Live September 11, 2001 Recorded Live May 12, 2007. On New Year’s Eve 1998, Unwound played a small club called The Cooler near the intersection of 14th & 9th. There was a small crowd, including Dean & Nash of Harvey Loves Harvey. Of all the 14 Actions, this is perhaps the most personal to the artists. Sitting on the curb outside the former club, Harvey Loves Harvey played a cassette tape of a live show by Unwound, recorded circa 1998. Although it was a cold autumn day, they invited people to join them in a small trip back in time, to the era of grunge rock and post-punk, an era before 9/11 and George W. Bush. At the end of the recording, they placed a specially made cassette tape on the ground near the site of their performance, and walked away. Like many great explorers in the past and future, Henry Hudson possessed the rare spirit to go where no one had gone before him. Not only driven by trade routes and economics, it was his responsibility to all of humanity, particularly in man’s ongoing quest for information about the world around him. He was the kind of individual that will always live on in our collective fantasy: someone willing to forge into the unknown, no matter the risk, making the ultimate sacrifice. There can be debate as to the word ‘discovery’ in this case, as native men already lived in Manhattan, and there may have even been voyages that landed haphazardly, or passed by these shores. But I hold that he discovered Manhattan in making it known to the world. He writes in the Half Moon’s log on September 11, 1609, ‘they found a good entrance, between two headlands and thus entered into as fine a river as can be found with good anchoring on both sides…’ He learned later upon further exploring the Hudson river that ‘It is on that side of the river that is called Manna-hata’ – and thus what we know now as Manhattan island was put to maps. Not much is known of Hudson’s life, where he was born and died still remains a mystery. All recorded history of the great explorer marks only 4 short years in which he explored the arctic circle through Siberia, Greenland and finally what we are standing on today. I don’t think we can really grasp what it was like to navigate by the stars across the Atlantic, endure weeks of near starvation and attacks by native people only to have your own crew turn on you. Henry met his end 700 miles north of this spot, when his crew, having spent the winter trapped by ice in what is now known as Hudson Bay, mutinied and set him – along with his son and loyal crew – adrift in a small wooden rowboat. It is this pursuit of discovery and ultimately information that we want to celebrate, his spirit of exploration into the unknown; the personal unknown as much as the geographic unknown. What is safety? How do we know that the buildings where we live and work are not on the verge of collapsing, of killing all inside? We trust our government to inspect these spaces and ensure our security, but do we know that this is truly happening? Harvey Loves Harvey selected a building at random, perhaps it’s proximity to a taco cart helped make the decision less random, and began inspecting all areas that they could access. They recorded their findings, looking for safety violations, possible areas for improvement, and any worrying discoveries. This process took them around the exterior of the building, and which the large number of roosting birds was noted, as well as an excess of dirt and grime. If these were safety concerns, they were noted and saved for the future. At the conclusion of their inspection, Harvey Loves Harvey posted an inspection certificate on the side of the building, and then ate tacos for lunch. Although they are artists, Harvey Loves Harvey have always been uncomfortable with the commercial aspects of the art world. To create work about ideas, where the questions of humanity and culture meet the creation of artistic experiences, is to be the kind of artist who does not necessarily make objects for sale. As Chelsea has grown into an important part of New York’s art scene, Harvey Loves Harvey saw an opportunity at the intersection of 14th & 7th. This unassuming location, on the sidewalk near a closed store, became an impromptu gallery. Harvey Loves Harvey provided a single work of art for sale, but its value was immediately noticeable. This photograph of the gardens in France that Claude Monet made famous in his paintings is doubly worthwhile: anyone who bought this image would own both a nice photo and, inherently, the gardens of Monet. Sadly, the weather kept potential buyers away. The few people who stopped to look at the work could not see its value, and left empty handed. In the end, Harvey Loves Harvey was forced to walk away from their business, leaving their merchandise behind. In 1861, Major General George B. McClellan was given command of the entire Union Army. He led his forces in a number of battles against the Confederacy, including the extensive Peninsula campaign which resulted in a series of defeats known as the Seven Days Battles. President Abraham Lincoln grew to despise McClellan, and relieved him of his command, only to reinstate him in the aftermath of the failed Second Battle of Bull Run. On September 17th, 1862, McClellan presided over the bloodiest battle in all of American history, the Battle of Antietam. While there were many opportunities to defeat the Confederacy forever, McClellan was too cautious and ultimately failed to end the Civil War. He even refused to pursue Robert E. Lee and his army into the South. Left with no other option, Lincoln permanently relieved McClellan of command. In 1864, citizen George B. McClellan stood at Tammany Hall, center of the New York political machine, and announced his candidacy as the Democratic Presidential Candidate. The General once in charge of winning the Civil War was now campaigning against Lincoln on a ticket that advocated an immediate end to the war, even if that end required recognizing a separate Confederacy. Harvey Loves Harvey re-enacted this moment on the steps of a building near the site of the old Tammany. They read aloud the words of a McClellan campaign song, and gave out buttons to passersby promoting McClellan for President. The name Harvey Loves Harvey tends to conjure many misconceptions about what the collaborative is about. People often presume things about the sexual preferences of the artists, and their relationship to each other, that are not true. At artist talks and lectures, people have often tried to talk around the name, referring to the artists as “That Harvey Harvey project” or “Harvey Versus Harvey.” This has led to some funny conversations, and even to a short-lived series of projects called Harvey Versus Harvey. For the 14 Actions, the artists thought it was time to lay these misconceptions to rest, and prove once and for all that they are macho, heterosexual dudes. Near the corner of 14th & 5th Avenue, in the center of Manhattan and one of the busiest intersections in the world, they chose to host a tailgate party, one of the most macho activities they could imagine. With chicken wings, sports drinks, and junk food to eat, they listened to a football game and shouted swear words at people on the sidewalk. They punched each other in the shoulder and arm-wrestled. At one point, when a woman walked by and told them that she was a Red Sox fan, Nash (the Bostonian of the pair) gave her a bear hug. At the end of the tailgate party, everyone was left convinced that Harvey Loves Harvey are as macho as any men alive. WHAT WOULD LESTER BANGS DO? Lester Bangs is perhaps the most influential music critic of all time. Writing forRolling Stone, Creem, The Village Voice, and a number of other outlets, his writing defines a generation of music. Although he died in 1982 of a drug overdose, his influence lives on. In the film Almost Famous, he was portrayed by the actor Philip Seymour Hoffman. For a time, Bangs lived near the intersection of 14th Street & University Place. Here, Harvey Loves Harvey stood on the sidewalk and polled passersby about music. They asked people to fill out a simple survey about their favorite album of all time, offering everyone the opportunity to be Lester Bangs, if only for a moment. Union Square is named for the union of several roads, most importantly Broadway and 4th Avenue (formerly the Bowery Road). Yet, it has historically been a gathering places for people to rally, protest, and mourn. At the start of the Civil War, people gathered to cheer for the war that would save the Union. During the rise of the Labor movement, union strikers would gather in the square to protest the unfair business practices of the era. After September 11th, 2001, Union Square was where mourners met to find solace. 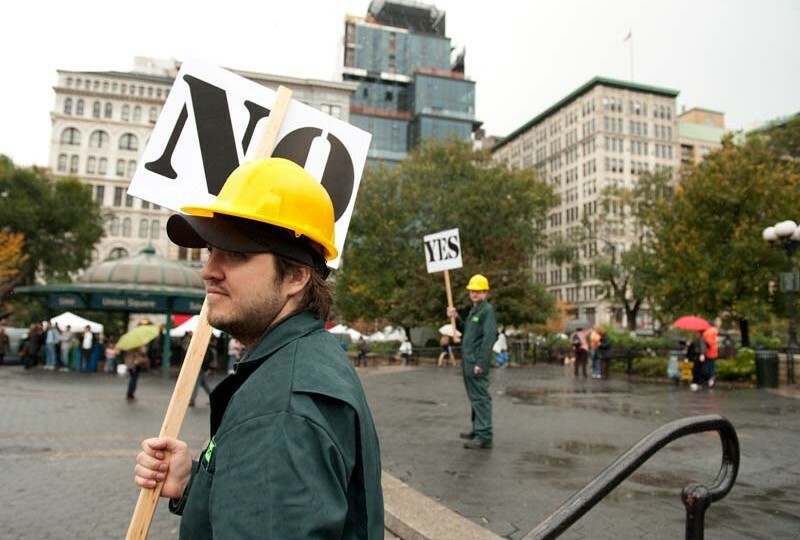 For the 14 Actions, Harvey Loves Harvey decided to stage a strike in Union Square. This strike was not directed at anything specific, and was instead intended to create conversation. Bearing signs reading YES and NO, Harvey Loves Harvey gathered cheering followers as confused onlookers watched from a distance. They learned that NO attracts more supporters than YES. Leaving their signs behind, Harvey Loves Harvey walked away, only to be drawn back into the protests as people took up the signs and started their own strike. In the end, Harvey Loves Harvey found themselves as spectators in the very strike they had created. In 1979, The Clash performed at the Palladium Theatre near the corner of 14thStreet & 4th Avenue. During that show, bass player Paul Simonon smashed his guitar on the stage, and the iconic punk moment was captured by photographer Pennie Smith. The picture became one of the best known images of the band, as the cover of their album London Calling. Today, the Palladium Theatre has been converted into dorms for NYU and a Trader Joe’s grocery store. Harvey Loves Harvey chose to re-make the famous photo with items bought at Trader Joe’s, to memorialize the site and emphasize the changes to the building over time. Nash entered the store, bought several loaves of bread, waited in line, and brought them to Dean. Photographer Rob Coshow framed the moment, and a new iconic image was made. After the performance, several passersby stopped to ask about the Action, and Harvey Loves Harvey gave them a custom-made version of the Clash’s London Calling, re-made as Trader Joe’s Calling. At the turn of the 20th century, as New York grew in size and scale, a number of proposals were submitted to the city for transportation systems. One of these was for a gondola cable car to run above 14th Street. The plan was never realized. For this action, Harvey Loves Harvey created fliers announcing plans to build this fictional system, and handed them out to commuters as the entered the subway station. This project proposes a vision of New York as it might have been, had different decisions been made in the past, and encourages a delight in seeing the everyday in a new and unexpected way. Harvey Loves Harvey hired illustrator Matt Laskowski to create an image of the imagined cable car system, based on a photograph of 14th Street. The artists stood facing the scene depicted in the illustration as they gave passersby the fliers. For the 14 Actions, Harvey Loves Harvey went to the corner of 14th Street & 2ndAvenue. Using chalk, they drew bases on the four corners of the intersection, and then called each other. What ensued was a ridiculous remake of “Who’s On First?” Eventually they were able to find each other, so they signed a baseball to leave behind. Beat poet Allen Ginsberg once lived at the corner of 14th Street & 1st Avenue. Here he wrote many of his best known works, and started a social revolution that he would lead for nearly six decades. His life and his work were devoted to teaching social justice, peace, humanity and personal realization to everyone he encountered. Today, on the ground floor of the building in which Ginsberg lived and worked, there is a McDonald’s fast food restaurant. For the 14 Actions, Harvey Loves Harvey went to the McDonald’s and ordered the largest Super Size Big Mac meals on the menu. At a table, they listened to a recording of Ginsberg reading his poem “America,” recorded in 1955. They had with them custom-made books of the poem, to read along as they ate. After listening to the recording, they exited the McDonald’s. Left behind were the booklets, and their half-finished meals. In 1966, Robert F. Kennedy traveled to Stuyvesant Town at the intersection of 14th Street & Avenue A to campaign for Orin Lehman. Two years later, while running for President of the United States, the former Senator and Attorney General was assassinated, just as his brother John F. Kennedy was murdered five years earlier. New York was always an important city for RFK, and he campaigned here constantly. His early political career began as Senator from New York, and he required the support of this crucial state in his bid for the Presidency in the open Democratic field left in chaos by Lyndon Johnson’s decision to not seek re-election. As the clear front-runner, the death of RFK removed the final impediment to the rise of Richard Nixon. RFK never made it to Stuyvesant Town to campaign. Thus, Harvey Loves Harvey chose to go to the gates of the community and wait, in the hopes that he might show up. Instead, Alex Zablocki, the Republican candidate for Public Advocate showed up, and saw the crowd that Harvey Loves Harvey could draw. Perhaps thinking the artists were not prepared to discuss politics, Zablocki engaged them in conversation and was surprised to spend an hour or more in intensive debate about health care reform, the wars in Iraq and Afghanistan, and the importance of public policy that promotes the arts. Zablocki did not win his election. Harvey Loves Harvey does not claim to have had any influence on this outcome.